I've been trying to work as well, but have been feeling so fatigued, mentally confused, nauseated, upset stomach, unable to eat or drink well and with headache. My anti nausea meds cause me to sleep right away and they give me a severe headache, so I'm not a big fan of taking them. However, as the nurse said before their purpose is to make me feel better than I would have without them. This seems discouraging because I can't imagine how badly I'd feel without modern medicine. 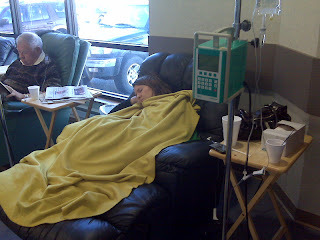 In meeting with the med-onc (chemo doctor) he said that my symptoms are normal for this chemo. I shared how I see people double my age who seem to be bouncing back much better than I and his comment was, "They are not taking Cisplatin chemotherapy". He said again that this is the chemo that gave chemotherapy a bad name in the 70's and 80's, but it is the best choice for my cancer and how it works with my radiation plan. He mentioned that they sometimes spread this type of chemo out and give it only once every 3 weeks to make it easier, but not when given with daily radiation like I'm having. I sure wish I had 2 more weeks before I go back in, but unfortunately I go back in this afternoon. On top of chemo the side effects of radiation are also kicking in and those can cause nausea, fatigue, diarrhea, skin irritation, bladder irritation, etc. My sweet children are realizing that this is hard on mommy and it is hard on them having a mommy in bed all the time. Please pray for them as they manage their own thoughts and emotions. Isaiah says he is okay and he doesn't need to talk about it, but Alyssa has cried more often than not lately. She has climbed into bed with me begging me to stop going to the doctor and asking if I'll ever be well again. It is heart wrenching, but I know that all this is so that I can spend many more good years with them and I'm focusing on that right now. That all goes smoothly with the I.V. as we've had some trouble lately and I was pricked 3 times just yesterday already. There are no severe reactions to the chemotherapy. They will not give me another diuretic today, but just extra fluids to help my kidneys. My parents are going with me today. Pray for their own strength as they watch their middle child do this. I know it is not easy for my supporters either. Thank you for your prayers, your meals, your generosity to my family and I. We've been sincerely blessed by many this week and I know that Billy, and my sister, Katy, who's living with us, deeply appreciated the help. This care calendar has been a real blessing for sure. It's very good for me to see how people really rally around and help those in need and those they love. You have so many people that care for you Kristi, that says a lot about you! For all of you that have given, thank YOU!